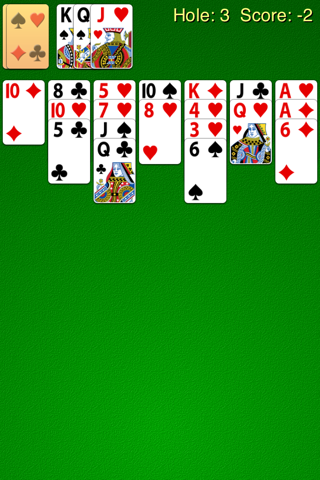 The board of Golf solitaire consists of 7 columns of 5 cards each, forming the tableau. The remaining 17 cards are turned face down to form the stock pile. The cards from the stock pile can be flipped over, one at a time, and placed on top of the home stack. The game begins when the first card from the stock pile is flipped. The cards from the tableau can be moved to the home stack in ascending or descending order only. Variations of the game exist where it is allowed for an Ace to be placed on top of a King and vice versa. The game ends when the stock pile is empty and no further moves can be made.